Time of Origin: London, 1952. History: The Xhinn's origins are lost in the mists of time. According to legend, they were formed from fire and banished from their plane back in the early days of the universe, and have, ever since, travelled the universe, believing themselves to be on a 'holy pilgrimage' of sorts across space, conquering worlds and draining them of their vital resources. They possess remarkable powers of energy-wielding and shape-shifting, and can even control the minds of others so long as the minds in question have been specially treated. The Xhinn are also controlled by a Triumverate that telepathically communicates with each other and decide when the time is right to strike, always dispatching an advance party before the main invasion begins. They eventually came to Earth in London, November of 1946, planting a sleeper agent by killing an American called Xavier Simmons and having one of them take his place, his memories wiped to allow him to better blend in with the natives. Believing that he had perceived an angel that night, Simmons became the priest of St Luke's Church, managing to have a considerable effect on the local population by 1952, even setting up a bread factory to support the poor and provide jobs, as well as putting the fear of Hell back into the community - something that Tommy Ramsey, head of the Ramsey Gang who ran that part of the city, wasn't exactly happy about, particularly when taken on top of a young man called Callum having created his own gang, which was muscling on the Mob's territory, and a new watchmaker who was leading the shops of the area in a campaign to avoid paying protection money. 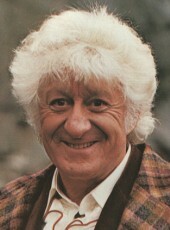 The watchmaker, as it turned out, was none other than the Third Doctor, who was working in the area with his companion Sarah Jane Smith following Sarah's discovery of a photograph taken on December 8th, showing The Doctor and Tommy shaking hands outside a church that showed signs of exposure to highly advanced weaponry. Attempting to avert the catastrophe that may occur, The Doctor and Sarah had taken jobs in the time, Sarah working as a barmaid in one of Tommy's clubs while The Doctor worked in the clock shop, trying to figure out what was happening. Eventually, things came to a head for the Ramsey Mob when they faced Callum's gang in a confrontation outside the Church, where Tommy cut off Callum's arm with a sword, forcing Callum to reveal his identity as a Xhinn. The Doctor managed to persuade the survivors to evacuate, before heading off to the TARDIS to prepare a defence against his new foes, while Sarah was forced to reveal the truth about her and The Doctor to Tommy as he prepared to strike back against the Xhinn. At the same time, the Xhinn released a smog weapon that poisoned London's atmosphere, turning it gradually toxic to any human breathing it directly for longer than a few hours, as well as activating a telepathic device that controlled anyone who had eaten Simmons' bread- even if only on a subconscious level, he had been aiding the Xhinn's invasion of his 'adopted' planet. With an army of brainwashed policemen after them - made even more awkward by the fact that these cops weren't going to let a little thing like death get in the way of tackling anyone opposing the Xhinn, - Tommy and the Ramsey Mob were forced to join forces with The Doctor and Sarah, and take the battle directly to St. Luke's Church, the Xhinn having taken the place over after revealing Simmons's true nature to him and stripping him of his powers. In a last desperate battle, where they were tragically unable to stop several humans being fried by the Xhinn in the name of their 'researches'- including Sarah's landlords and a single mother of three who lived near Tommy's house, - The Doctor was forced to use the weapon that the photograph had revealed; a time bomb, a weapon that accelerated time in its immediate vicinity, aging anything in the blast radius to death. When the Xhinn still refused to leave after that, The Doctor triggered the weapon, destroying all three of the Earth Triumvirate. After the photographic prophecy had been fulfilled - a newspaper reporter taking the picture after questioning Sarah, The Doctor and Tommy about the destruction of the church - The Doctor and Sarah departed, unaware of the fate of Xavier Simmons; Simmons had only been stripped of his Xhinn life force, and he would thus will walk the Earth as a human for the next fifty years, growing older, waiting to find out if - as was speculated by The Doctor - there was a signal beacon hidden somewhere in the condemned church.